This weekend marked the beginning of the Roaring Fork Mountain Niño’s 2010 winter Special Olympic sports. Each year the athletes compete in skiing and snowshoeing. Ski training is on Saturdays, snowshoeing on Sundays. The athletes can participate in both practices, but only compete in one discipline. Alex is a skier, and will not consider snowshoeing. I would like Alex to exercise both days of the weekend – but this is a battle I know I will not win – or if I do I will sustain too many injuries. 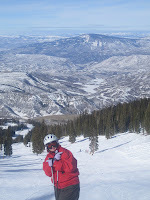 She will be skiing every Saturday, and Sundays we will relax. Alex is very predictable. I can not always figure out what is dictating her behavior, but I can usually anticipate her actions. Yesterday was a great example of this; it appears that Alex has a jammed thumb from basketball. I say “appears” as this injury occurred when she was told she could not play in the most recent basketball game. Alex sat on the bench for the C team the JV games, dressed with her hand wrapped. Behavior motive uncertain – action predicted. We looked at her thumb, and it did appear a little swollen, but she can move her hand. Sneaky Alex, she was able to get the school nurse to wrap it with a splint, and it became a legitimate injury. I say it is a psychosomatic injury directly related to her playing status. Alex has been known to be the little girl that cried wolf – so although it may appear that I am callous – I will take her to the doctor on Monday if she is still complaining. However, I do believe I am correct about my diagnosis, skiing was not a problem for Alex. We got to the mountain on time (a first) met up with Alex’s coaches, Cammi and Paul, and two instructors from Challenge Aspen. Challenge Aspen and the ski mountain have been very supportive of our Special Olympic Athletes; donating instructors and access to mountain. To add to this incredible generosity – Challenge Aspen sent two MALE instructors named Matt. As we all know, Alex prefers y chromosomed people. I helped Alex get ready – something I do not usually do – she is perfectly capable of putting on her ski pants, boots, gloves, helmet and jacket – but she takes a VERY long time. I tried to ignore the wrapped hand and told her it would be fine. Alex argued and whined, “You are hurting me, I can’t hold my pole”. As I am a gullible, but wise mother, I asked one of the Matts to help. Bingo – hand does not hurt, ski pole attached. Off they went, one happy 16 year old girl with down syndrome, following two Matts. We met up at the end of the day; Alex was smiling, as were the coaches. According to the coaches Alex skied great, she did complain about her hand a bit, and whined occasionally – but this is not unusual behavior for Alex, or my other kids. Successful in my book! The Regionals are in February and the States in March. This year John and I have split up the competition schedule – he will go to Regionals and I will go to States. This works well for me, the Regionals are geographically difficult, over one of those curvy and windy mountain passes; the States not quite as bad. Looking forward to it - I love the Special Olympic events.